Apple improved the already popular Dual USB iBook by boosting CPU speed 100 MHz and using a newer version of the G3 with a twice-as-large 512 KB level 2 cache. The entry-level 600 MHz model has a CD-ROM drive, while the 700 MHz one includes Apple’s Combo (CD-RW/DVD) drive. The new Mobility Radeon is up to 35% faster than the graphic chip in the previous model. Apple distinguishes the Mid 2002 models by their 16 MB of video memory (VRAM). 12″ 4 Pound Averatech N2700 Exactly What Apple Should Be Building, Charles W Moore, ‘Book Value, 2009.05.11. This lightweight laptop has the power of the MacBook, the footprint of the 12″ PowerBook, and a $699 price tag. Looking back at the Dual USB iBook on its eighth birthday, Charles W Moore, ‘Book Value, 2009.05.01. 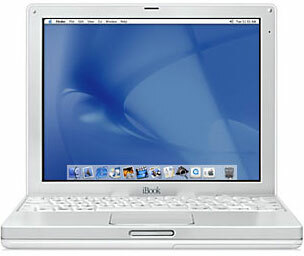 Introduced on May 1, 2001, the white iBook had a fresh new design that endured until it was replaced by the MacBook five years later. Unibody MacBook ‘an excellent successor’ to 12″ PowerBooks and iBooks, Charles W Moore, ‘Book Value, 2009.04.14. The MacBook is a bit wider and lacks FireWire and a built-in modem, but overall it’s a worthy successor to the Apple’s 12″ ‘Books. Skip 867 MHz 12″ PowerBook, iBook sleeps when touched, Netscape 7.0.2 keeps crashing, and more, Charles W Moore, Miscellaneous Ramblings, 2008.06.11. Also getting a copy of the Mac OS for a Power Mac ONE, and whether it can run Linux. Dell’s 802.11g card for PowerBooks, glad for the death of Classic, FireWire cams, and more, Charles W Moore, Miscellaneous Ramblings, 2007.11.05. Also silent computing with ‘obsolete’ Macs, Leopard and the 867 MHz limit, and Tiger performance on a 600 MHz G3 iBook. A stinky old iBook that smells like sweat, Hardy Menagh, Empowered, 2006.10.13. You just don’t expect an iBook to smell like strong perspiration, but this problem seems to afflict a number of G3 iBooks. iBook (white) disk upgrade pages, Graham Cox, 2003.02.26. Step-by-step instructions for replacing the hard drive in an iceBook. Tote and Tilt Adds Handle to New iBook or TiBook, The ‘Book Review, 2001.10.19. $40 and $45 handles make it easy to transport iceBook, TiBook.